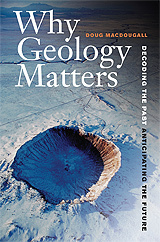 Book review: "Why Geology Matters: Decoding the Past, Anticipating the Future"
This review first appeared in Turbula in June, 2011. Doug MacDougall, emeritus prof over at Scripps Institution of Oceanography, has presented one of the most balanced explanations yet of global climate change and man's likely role in the current warming. His new book, "Why Geology Matters," lays out the current state of the art in how our scientists try to figure out past climate change in a way the average, non-scientists can easily understand. His conclusion? Our planet's climate changes all the time, albeit on a (to us) very slow pace  and if we're contributing to a current warming trend (by pumping additional tens of millions of tons of carbon dioxide into the atmosphere), sooner or later our descendants were going to have to confront massive climate change anyway. Unlike much of the debate over global warming, MacDougall is very balanced and sticks to the science  explaining what we know and don't know. He never delves into the political debates, although he does acknowledge them toward the end. And skeptics of man's role in global warming should at least apreciate his willingness to admit gaps in our scientific knowledge (no, we don't understand exactly how or why the climate changes over time) and his lack of moralizing on the issue. At the same time, MacDougall's assemblage of facts is pretty clear  carbon dioxide levels in the atmosphere and oceans are 30 percent higher than they were at the start of the Industrial Revolution a century and a half ago. And the record (ice cores dug from glaciers in Greenland and Antarctica, plus sedimentary layers found around the world) is clear that when the atmosphere's carbon dioxide ratio goes up, so do temperatures. Yet there's none of the holier-than-thou tone or alarmism found in so many of the current crop of books about global warming. In fact, MacDougall specifically debunks the likelihood of manmade global warming turning Earth into another Venus, pointing out that the oceans can still absorb a large chunk of the CO2 we're creating (although not without its own changes, such as being able to support smaller marine populations)  and that with known oil deposits rapidly dwindling, our ability to pour carbon emissions into the air probably won't last much longer. Still, given the fact that Earth was already in an interglacial warming period, all that extra carbon in the atmosphere can't help but reinforce the trend. And as the polar ice caps and other glaciers melt, the Earth reflects less of the sun's energy back into space, absorbing more and again accelerating the warming. As we've come out of the last ice age, we've enjoyed some 20,000 years of uncommonly mild weather around the globe, on average. MacDougall's best guess is that the next 20,000 to 30,000 years will see a steady warming trend before the natural processes that have tended to moderate the Earth's climate are able to remove the carbon dioxide from the atmosphere and allow the Earth to begin cooling. Books like this, in which top research scientists explain in lay terms the work they are doing, are important at least in part because so much of the science being done is paid for by taxpayers. MacDougall has given us a gem, a book that removes emotion and moralizing from the equation and provides a sober analysis of why most scientists have come to the conclusions they have about how human activity has started to play a role in the Earth's climate.